I don't know. There's this former quarry, usual thing, almost enclosed, high cliffs, where they've built an estate of pretty expensive houses. Who can afford them? Older people, mostly. And what do the developers then do, as a parting gesture? Build a playground with a really good flying fox (= zipline, American readers). So people bring their kids there to enjoy it, shrieks of delight echo round the walls of the quarry, the residents complain about the racket, and the council closes the flying fox. Sigh. I love ziplines. What's not to enjoy? You whizz through the air, high above the tree tops, usually with a pretty spectacular view if you ever were undistracted enough to appreciate it, and finish with an exciting swing - and it's all as safe as houses. If the crabby homeowners in the quarry ever got over themselves enough to have a go, they would understand the delight; but, sadly, that's not going to happen. The first non-playground one I ever did was at the end of the high ropes experience at Outward Bound, which our group did at night for extra thrills. (That was an excitement too far for one member of our watch who, having been shown the rope course earlier that afternoon, decided discretion was the better part of valour, and quietly opted out of the entire OB experience, hitch-hiking from Anakiwa back to Nelson. He was a reporter there to write a story about it for the Nelson Mail - I've wondered ever since what he told his editor.) High ropes are all about teetering and inching, so when we got to the end of that sweaty business and were able to sit on the T-bar and zoom through the darkness between the trees, it was a glorious release. Then there was the one in Queenstown, which is the fastest way back to town from the top of Bob's Peak. The company running it has an eco-conscience, and while moving between the six different ziplines the punters are told about environmental concerns and introduced to the idea of Kiva loans to small businesses in third-world countries, so yay for them. 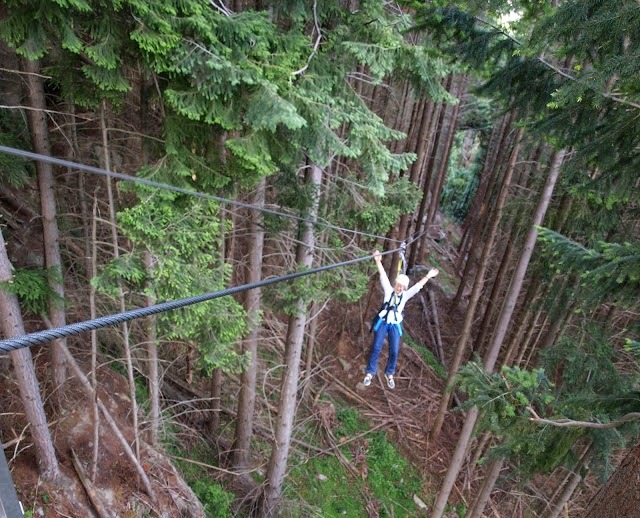 But honestly, you're there for the thrills, and Ziptrek doesn't disappoint. The views over Lake Wakatipu are fabulous but entirely wasted because it's just so much fun to hear that whine from the runners as you skim down the slope to the next platform. There's just nothing like that moment when you launch yourself into nothingness. 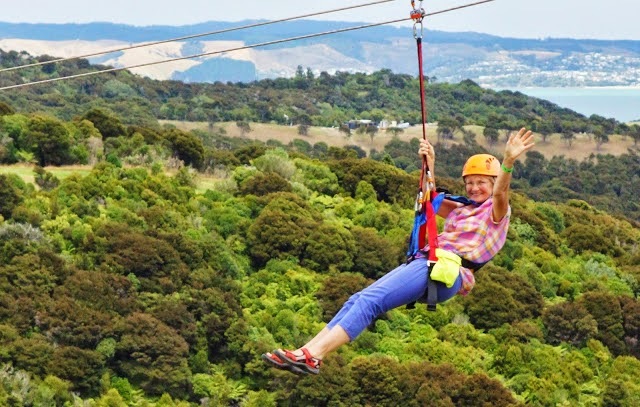 They have another operation on Waiheke Island, too, which has fewer lines but one of them is really steep and long, and gives you a great rush, literally. Afterwards there's a gentle and pretty climb back up through the bush, so nobody at the top waiting to go is put off by any wild-eyed gibbering from previous punters. Waitomo is where everybody goes to sit in a boat and be rowed through the caves to look at the glow-worms, which is has been appealing to tourists for over 100 years now, but it's very sedate. Much more brag-worthy is to abseil 35 metres down into Ruakuri Cave there, walk through absolute pitch darkness with a headlight illuminating the 'tites and 'mites, and then zipline through them with your light out for what feels like five minutes (but isn't). Very cool! And there are giant cave wetas to follow, too. The only overseas operation I've done - so far - is at Ketchikan in Alaska, where the point of difference (apart from eagles circling not very far overhead, and the chance of spotting bears way down below at the bottom of the trees) was that the platforms between the eight lines had no railings. It was all perfectly safe, we were harnessed up and attached at all times, but it did add to the buzz, being able to peer straight over the side from near the top of tall spruce and hemlock trees. There were three swing bridges to sway over too, between platforms. Good fun! Not that those kids in the quarry playground will ever get a taste for it. Shame. Twelfth Night - or is it?